O lovers of Shah Mardan,Salam to you from heavens, from the skies.May Janab-ul Haqq Subhana wa Ta’ala, for the honor of His Beloved, remove burdens from us, and may the manifestation of mercy come. May the manifestation of grief be lifted from us.”Falhukmu Lillahi l-aliyyi al-kabir.” (40:12)(all Judgement is Allah’s). If we have burdens, may these burdens be lifted from us. marhaba to us as well. May we open, may we feel relieved, may we feel happy, may we cheer up. States of a man don’t match with each other. companions, may their beautiful state come to us as well so that we open. There are many signs torturing people in this world. come to others as well. Mardan, your expressions are perfect. May we feel relieved, find comfort. Time has become the last of times. We’re not at the beginning of the world. The world is going towards its end. We’re flowing towards the Judgment Day. May Allah give us peace of faith, give us health of a body, grant us adab. Its blessing is coming down on the mighty Kaaba we ask for it too. May that mercy come down on us too. Go ahead, O lovers, marhaba to you. May our burdens be gone, may relief come, may comfort come, may ease come. The world it has its beginning and its end. Go ahead, O Shah Mardan, your lovers adore you. We’re not living for this world. Those who live for this world have turned against each other. The other says, hasha min-al hudur “Go away! The world is mine.” Eventually, the world belongs neither to one nor to the other. It is important to know what to ask for. You should know what you live for. Servanthood is complete with love. Who doesn’t love cannot serve. See You have to love in order to be served. Janab-ul Haqq doesn’t want servanthood by force. You dressed Your Beloved with Your love. You dressed our Master, the Master of the Universe, in love. O man, carry love according to your rank. Go ahead, O Shah Mardan. They ask for love, too. Sheikh Mehmet Effendi, our son, exchange love. How nice! Go ahead, O Shah Mardan. O my lovers, exchange affection Allahu Akbar. There is nothing else in this world, no other trade. May I open. Exchange love and affection. This is the biggest trade, the exchange of affection. May we love and be loved according to our ranks. Allahu Akbar. Allahu Akbar. Allahu Akbar wa Lillahi l-hamd. Who doesn’t exchange love is a blockhead, a log. Come to this world to exchange love. Allahu Akbar. Allahu Akbar wa Lillahi l-hamd. O our Lord, you called him Your Beloved and gave love. You gave love to our Master, my Beloved Muhammad Mustafa. Janab-ul Haqq said “O My Beloved, I fell in love with you. I made you Muhammad Mustafa. I chose Ahmad and Mahmud to be Muhammad. May we open. May we open on the way of Allah. Who has love in his heart doesn’t die. Go ahead, O Shah Mardan your lovers adore you. This is what we ask for. Don’t ask for gold, don’t ask for silver, don’t ask for jewels. Ask for the love given to His Beloved from Divine affection, search for that. O our Lord, my Janab-ul Mawla who causes the sun to rise every day and causes it to set every day, may we have from that light as well. May we live with that light as well. Allahu Allah Allahu Rabbi Allahu Allah ma li siwahu. Ya Rabbi, don’t give us (worldly) enjoyment. I want to reach that rose garden with pure faith. Ask there are rose gardens Love opens and love is opened in our hearts. O our Lord, Hasbun Allahu wa ni’mal waqil. Go ahead, O Shah Mardan. Your lovers adore you. See, what a nice saying. What a beautiful saying, O Shah Mardan. Allah has filled with divine affection. O Shah Mardan, you are Shah Mardan. You were filled with affection. O Shah Mardan, go ahead your lovers adore you. Beautifully sweet… They want from that sweet friendship, sweet affection. They’re not after eating and drinking. The world is beneath their feet. Heavens and skies, the sky is above their heads. O man, know what to ask for. It’s there. And what are you? What is your demand? The world is cast away. It’s thrown away. Strive to receive the affection of those skies called heavens. Be loaded, full of affection. Your lovers adore you. You’re loading them with love MashaAllah. You’re filling them with affection. MashaAllah. The world is beneath your feet. Janab Allah has put the world beneath the feet of people. Angels are in the skies. Don’t have desire for what is beneath your feet. What is under our feet is the world. Don’t have desire for it. Look at what is above you. Our Mawla gave us honor. He gave honor with His Beloved. Allahu Allah Allahu Rabbi. Allahu Allah Allahu Hasbi. You’ll be beautiful. You’ll be beautiful. Say Allahu Rabbi Allahu Hasbi. You’ll be beautiful. Who says “Allah”, reaches all his goals. What a nice teaching. Who says “Allah”, reaches all his goals. Teach us so that we say Allah too. May we not have goals other than Allah. O our Lord, how beautiful You are. What is our trouble? Our trouble is because we can’t reach that love. Teach us about that love. Let us taste the Divine Love you’re tasting. The world is beneath our feet. It’s not worth a penny. The value of a man is worth the amount of love he carries. He said “O My Beloved”. No one has the affection he has, our Habibullah, the Master of Universe, the Praise of Universe. Who says “Allah” won’t be destroyed. Describe our Beloved to us as well, O Shah Mardan. MashaAllahu kana wa ma lam yasha’ lam ya’kun. Rubbish dunya. Know what to ask for. Know the jewels. Open up. Our Mawla who created us is Subhan, Sultan. O our Lord, what shall we do? Our Mawla gives us according to our states. Shah Mardan receives from that fountain. Shah Mardan received Divine affection from the son of his uncle (sas). He glowed. His sultanate will succeed both in this world and in the hereafter. Shah Mardan. May we not live for rubbish dunya. May we live for the lover of His Beloved. The Beloved loved his Creator. It was said “O My Beloved” and he was fallen in love with. He lovedand was loved. Lovers, this is our lesson. Shah Mardan is talking to us according to our state. An ant has its own provision. An elephant has a different provision. O our Lord. Our Lord. Our Lord. May we love, may we make others love. May our work be this. You loved Your Beloved, You made him love. May we love too, and make others love. Dunya. Paradise gardens are great. May we love and be loved. Be beautiful! The Mawla created you beautiful. Don’t be ugly, be beautiful. Everything descending from heavens is beautiful. Everything you collect in this world is rubbish. Don’t collect anything in this world. Collect what comes from heavens. Who says “Allah” reaches all his goals. Our Allah, forgive us, forgive us, forgive us, our Allah. Who loves Allah is beautiful. Who is the most beautiful in the universe? Our Master. There’s no one who loves his Lord like he does Love brings beauty. Exchange love to be beautiful. Allahu Allah. Allahu Rabbi Allahu Hasbi. We sacrifice our heads on your way. We ask Welcome from you, so that you say “Marhaba” to us. Today is the day of holy Juma. May it come down on us too. May our burdens be gone. They won’t leave burden on you. Long live those who listen to Shah Mardan. 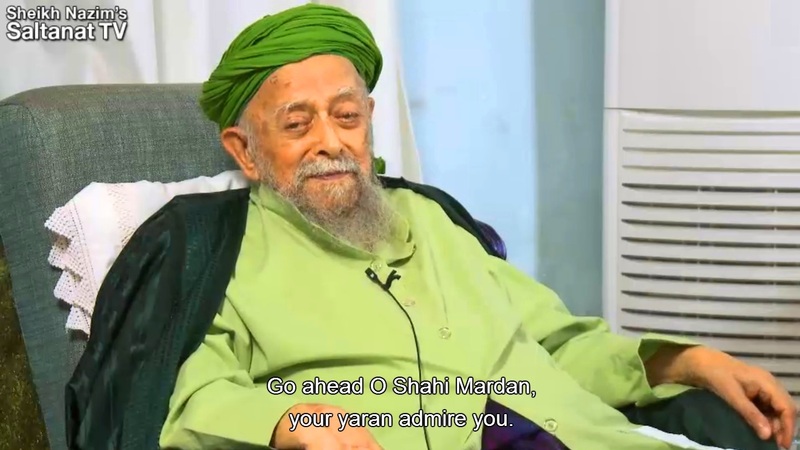 This entry was posted on October 7, 2013 by ASFC in Ahmed Amiruddin and tagged Mawlana Shaykh Nazim Adil al Haqqani, Mevlevi Haqqani, Shah Mardan, Shaykh Ahmad Dede.